Why Are Tech Marketers Their Own Harshest Critics? 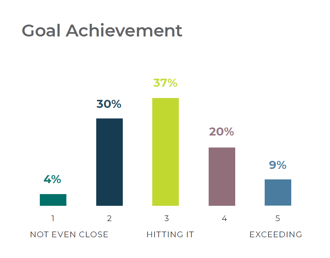 According to our State of the Industry survey, 66% of you are hitting—or exceeding—your primary KPIs. 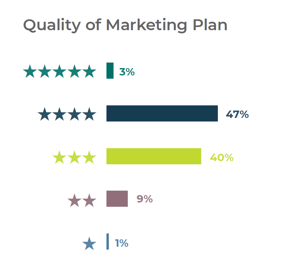 Yet, despite that success, only 3% of you rate the quality of your marketing plan worthy of five stars. What gives? So…why are tech marketers their own harshest critics? Digital marketing is always evolving, so there is a never-ending list of tactics to try and then tweak. The problem? There aren't enough hours in the day (or dollars in the budget) to do everything you want. Tech marketers, especially those at VC-backed companies, are under immense pressure to produce results. Can't prove ROI? You just might be out of a job. Hit your goals this month? They're going to be even higher next month. How can tech marketers improve the quality of their marketing plan? First off, take a moment to pat yourself on the back. Recognizing your current success doesn't mean you have to become complacent…it just means you should celebrate what you've done right, too! Consistently working on projects for long periods can feed your doubts and criticisms. Step away and occupy your mind with something else. Find the thing that you enjoy in your free time and make time for it. I, myself, find doing brain teasers and other puzzles help me to find a new angle to getting my ideas across. It’s okay to not always look at your work with blind optimism. Even the best of marketers realize that not everything pans out the way they hoped. Realize that not all work is going to be prefect the first time around. Going in with that mindset can help stop you from beating yourself up if a mistake is made. Utilize someone well adversed in your industry, whether you find them through your network or somewhere else (like LinkedIn). 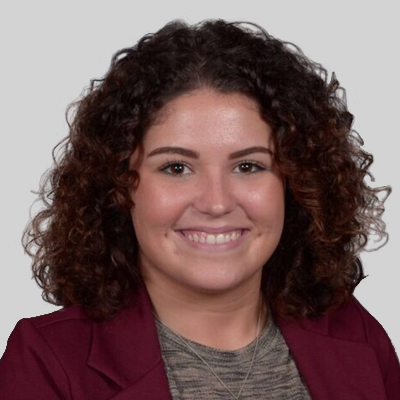 This mentor can help you build an environment that makes you feel comfortable with being wrong now and then. Because when you think about it, they had to start somewhere too and now they're a model for marketers like you to look to for guidance. Sometimes projects start to build up and you're only one person with one brain. So, don't turn your nose up to using a marketing agency to make your job easier. Especially if they specialize in your particular industry, like we do with B2B software and technology companies. Believe in what you're capable of! But also realize there may be a point where you might hit a wall and can't do everything like some marketing superhero. That's where we swoop in and save the day.